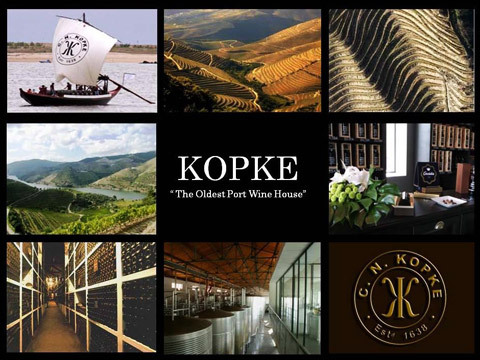 Kopke is the oldest port house in the world and boasts an impressive collection of aged colheita ports. In 1638 the German diplomat Cristiano Kopke founded the Douro wine shipping company that became universally recognized as the first Port house in Port wine history. In 2011 Porto Kopke will celebrate 373 years of continuous production of fine porto with grapes from its famous Quinta São Luiz with its many gold-medal winning vintages. However, it wasn’t until 1675 that a shipment frostencil-new.jpgm the Douro to Holland was first called “Porto” and in 1678 that the Oporto customs office registered its first shipment of Porto to England. The hand stenciled Kopke Port bottles express the traditional artisan quality and nostalgic appeal long associated with the enjoyment of the finest ports. The Kopke Vintage Port 2016 is firm, intense, crunchy, unctuous and fresh. It’s multi-layered in flavours, firm tannins and has an excellent balance between sweetness and acidity. "A deep black colour. An intense and complex nose, laden with very ripe black fruit – plums, blackberries and cherries. Notes of cocoa, black pepper and a soft hint of violet. Unctuous and vigorous, it has several layers of flavours, firm tannins and excellent balance between sweetness and acidity. A long, deep and fresh finish." Kopke produce some excellent vintage ports in addition to their unsurpassed range of colheita ports. Kopke own the exceptional vineyard Quinta São Luiz. This allows them to produce excellent Single Quinta Vintage ports. That is a port of one harvest year, from one vineyard. Quinta st Luiz Vintage Port MAGNUM 1.5L in original box as illustrated. Balancing the intensity of flavours, the LBV is the ideal choice to serve with main courses of meat, like filet mignon encrusted four peppers and veal cutlet with Bérnaise sauce. Its versatility knows no borders, being perfect to combine with an exuberant cheesecake of chocolate mint, a pear and chocolate mille-feuille or simply to enjoy with cheeses of medium intensity. The 2003 Kopke Single Harvest has an intense red colour with a tawny halo. Presents a complex bouquet of dried fruits, standing-out the spicy notes. Sophisticated and delicate in taste. Good structure, well-balanced acidity and a pleasant unctuousness. Long and persistent finish. Enjoy this exemplary port lightly chilled with fruity desserts like tarte tatin, creme brulée or Christmas pudding, even rich chocolate mousse. The classic pairing of Stilton cheese is also excellent, as are ripe tropical fruits. The 2003 Kopke White port has a cool, light-amber color. This unique white colheita derives from the traditional white grapes of the Porto e Douro region. Starting with aromas of a Pear Clafouti and burnt sugar, this elegant port delivers luscious flavors of Japanese pear-apple, with accents of hazelnut, nutmeg and orange zest. The lingering grapefruit finish provides the perfect balance for the sweetness. History and exclusivity are two of the words that best describe Kopke, a brand synonymous with prestige. Kopke existed even before there was a demarcated Region of the Douro. Established in 1638, the oldest Port wine house built an impeccable reputation based on the highest quality. A leader in the production of Port Tawny Colheita wines, including white port, Kopke has a remarkable and highly awarded range of special category Ports. An extremely rare bottle of 40 years aged White Port. Please note that these are half bottles. Colheita Port (Comes in Original Kopke box as illustrated). An outstanding 1944 Single Harvest Colheita port. This port has a bright amber colour with a brown-tawny halo. Elegant nose of dried fruits, well integrated with wood notes. Light and fragrant, with wonderful volume and structure. A wine with great freshness and multi-dimensional flavours. Delicate and persistent finish. An outstanding 1937 Single Harvest Colheita port. Level in neck. Handwritten label - Kopke 1900. Provenance stored in family cellar. handed down through three generations.